Traditional absolute valuation methods can’t be applied to cryptocurrencies like Bitcoin and Ethereum. This column instead applies relative valuation models to crypto-assets, leveraging Metcalfe’s theory of communication system valuation. 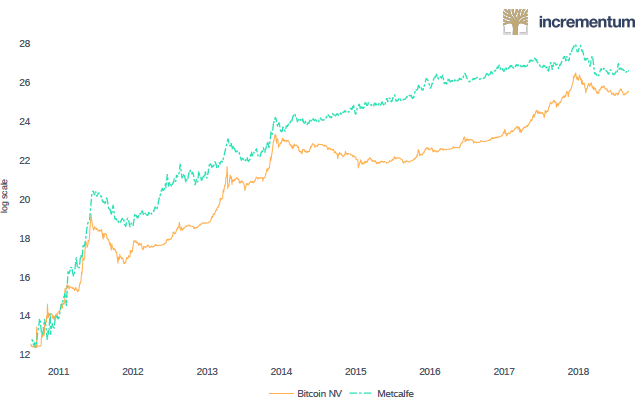 Preliminary results show that the network value to Metcalfe ratio is relatively successful at identifying periods when Bitcoin was over-and undervalued. Financial market participants are becoming increasingly interested in forecasting future prices of crypto-assets. In the literature, there are two distinct methods for valuing crypto-assets. The first is absolute valuation, which allows investors to calculate a ‘fair’ price for each asset. Next, the investor compares the theoretical ‘fair’ price to the real price that the asset is selling for on the market. If the price on the market is higher than the ‘fair’ price, then the investor receives a sell signal and vice versa. This is similar to the stock market, where analysts calculate the net present value of future firm revenues or of dividends, to arrive at what the stock should be priced at today. However, cryptocurrencies do not have financial statements that disclose the revenues of the application using the cryptocurrency. Additionally, most cryptocurrencies do not pay dividends. Therefore, cryptocurrency prices cannot be easily forecasted with traditional absolute valuation models. The second method is relative valuation. Relative valuation models allow investors to compare several assets; however, relative valuation models do not output an expected value for the price of the asset. Instead, relative valuation models often output ratios such as the price-to-earnings (P/E) ratio, which compares the price of an asset to the earnings of a company (Fama and French 1992). Cryptocurrency analysts adapted this general valuation framework by computing each crypto-asset’s network value to Metcalf (NVM) ratio, network value to transactions (NVT) ratio, and a metric that combines the concepts used in the two prior ratios, called the network value/transactions to growth (NVTG) ratio.Higher ratios mean a cryptocurrency is overvalued relative to other coins. In this column we use the second method – relative valuation – to compare various cryptocurrencies. Our calculations suggest that the market capitalisations of Bitcoin, Litecoin, and Bitcoin Cash are valued above their long-term mean market capitalisation. In the 1980s, Robert Metcalfe, an employee at the Xerox Palo Alto Research Center (PARC), devised the Metcalfe theory of how to value communication systems (Metcalfe 2013). His original intent was to describe the purchases and connections of the ethernet, which was a predecessor to the internet. Today, the theory is used to value a network and its users, such as internet businesses like Facebook and eBay. Metcalfe’s model proposes a relationship between the value of a network and its size, typically measured in number of users (Metcalfe 2013). More specifically, he argued that the value of a network is proportional to the square of network nodes (users). For example, assume the social media network Pinterest has n users, then the utility each user derives from the network is proportional to (n – 1), i.e. the number of potential connections in the network. This relationship between utility and users is the ‘network effect’.If an additional user joins the network, it increases the utility of the others, and assuming that all connections are equally valuable, the total network value should result proportional to n*(n – 1), which in turn is asymptotically proportional to n. Metcalfe himself showed a very good fit between his proposed law and Facebook´s revenue (which he used as a proxy for network value) by measuring user data over the past ten years back in 2013. For example, assume Facebook’s revenue in a given period is approximately $40 billion, and the sum of Facebook’s daily active users, a measure used to proxy the size of social media network, is approximately 2 billion over the same period. By putting these two figures in relation to each other, i.e. $40 billion over 2 billion, we obtain a relative network valuation metric we can compare among social media peers. Much like online networks, crypto-assets are networks of users that are connected in digital space and can interact with other users. Metcalfe’s law means that the more people adopt cryptocurrencies, the more utility each user derives from the network. Ultimately, the result is a proportionately higher network value. A security effect: systems that are more widely adopted derive their consensus from larger consensus groups, making them more difficult to attack. A payment system network effect: payment systems that are accepted by more merchants are more attractive to consumers, and payment systems used by more consumers are more attractive to merchants. An integration network effect: third-party platforms will be more willing to integrate with a platform that is widely adopted, and a greater number of these tools will make the platform easier to use. A size stability effect: currencies with a larger market cap tend to be more stable, and more established cryptocurrencies are seen as more likely (and therefore by self-fulfilling prophecy actually are more likely) to remain at non-zero value far into the future. A market depth effect: larger currencies have higher market depth on exchanges, allowing users to convert larger quantities of funds in and out of that currency without taking a hit on the market price. An interpersonal single-currency preference effect: users prefer to use the same currency that others are using to avoid interchange fees when making ordinary transactions. An intrapersonal single-currency preference effect: users that already use a currency for one purpose prefer to use it for other purposes, both due to lower cognitive costs and because they can maintain a lower total liquid balance among all cryptocurrencies without paying interchange fees. Different types of crypto-assets may exhibit different types of network effects as well – a payment token like Bitcoin will probably exhibit a stronger interpersonal single-currency preference effect than a utility token like Ethereum. There are three main variants of the network effect ratio. The first is the network value to Metcalfe ratio. The model implies that the price of a crypto-asset stands in a direct relation to a fundamental value measured by user utility in the long run and that some form of reversion to the mean takes place.1 The network value to Metcalfe ratio puts the respective variable for describing the size of the network in its denominator, while using market capitalisation as a proxy for network value in its numerator. In a first step, we approximate the size of a given cryptocurrency’s network with the number of the cryptocurrency’s users (n). Due to the pseudonymous nature of cryptocurrencies, we cannot directly measure the number of users of each cryptocurrency. Therefore, we further assume that the number of cryptocurrency users can be approximated by the number of unique addresses that are active on a given day – meaning that they are participating in sending or receiving transactions.2 Future research will inevitably have to consider nodes on the lightning network as well. Unique addresses in the Bitcoin ecosystem are payment addresses that have a non-zero balance. While the number of unique addresses is not a perfect measure of the actual number of users on a given day, it generally holds that the more unique addresses are in use the more users the network has and vice versa. Since we are trying to arrive at a long-term fundamental metric, we additionally smooth the daily active user number to a 30-day moving average in order to get rid of stark daily fluctuations related to noise. Figure 1 plots the market capitalisation of the Bitcoin network against the network value to Metcalfe ratio. A strong and positive correlation coefficient of 0.9653 for the time period between 17 August 2010 and 19 September 2018 exists. Figure 2 shows that large spikes in Bitcoin’s NVM ratio were succeeded by subsequent declines in its market value. The orange trace corresponding to the market value of Bitcoin is depicted on a log scale. The vertical axis on the chart represents the log scale on the left and the current value of the NVM multiple on the right. Although further robustness checks are required, the preliminary results indicate that the network can experience ‘bubbles’ where a cryptocurrency’s price in relation to the number of active users is unsustainable. We can see this quite evidently during the periods of early 2011, mid-2012, early 2013, and late 2017. 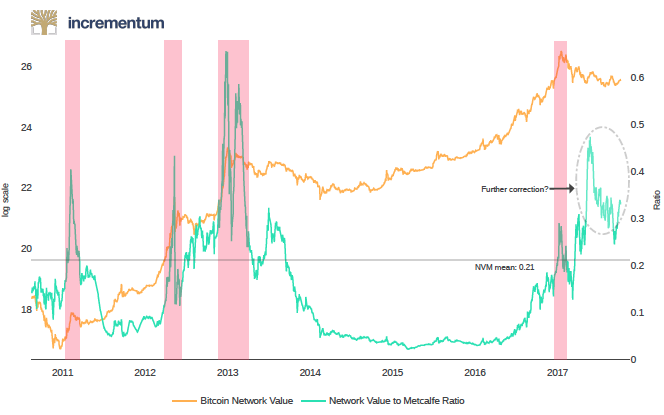 What we can see is that once NVM moves significantly above its long-term mean (0.21), there are reasons to be concerned about the future near-to-middle term evolution of Bitcoin’s market value. Conversely, an NVM well below its mean has typically meant a good buying opportunity. The current level of 0.33, however, indicate a worrying picture for the state of Bitcoin and strongly suggest a further downwards correction.The extended version of the article including valuations of litecoin and bitcoin cash can be read in Hays and Valek (2018). Additionally, the article explores two additional ways to calculate the Network Effect ratio for cryptocurrencies including the transaction value to network effect ratio and the combination model network value and transactions to growth ratio. While sensibly sound, Metcalfe’s law did not go without controversy in the academic community. Odlyzko and Tilly (2005) raised a valid concern about the model – while Metcalfe’s Law suggests that the utility expressed in terms of potential connections of users within a network can theoretically approach infinity, there are in fact certain limitations on the usefulness of additional network participants to the individual user after the network has reached a certain size. Another heavily scrutinised assumption was that each additional user contributes an equal amount of value to the network. It makes sense to argue that for a network of millennial Snapchat users, the addition of further friends entails more utility than if their parents join the network. Buterim, V (2014), “On Bitcoin maximalism, and currency and platform effects,” Ethereum blog, 19 November. Fama, E and K French (1992), “The cross-section of expected stock returns,” Journal of Finance 47(2): 427–465. Hays, D and M J Valek (2018), “Smart contracts: Liechtenstein’s blockchain strategy, the ‘network effect’ as valuation methodology,” Crypto Research Report, October, Edition IV, Incrementum. Metcalfe, B (2013) “Metcalfe’s Law and 40 years of Ethernet,” Computer 46(12). Odlyzko, A and B Tilly (2005), “A refutation of Metcalfe’s Law and a better estimate for the value of networks and network interconnections,” University of Minnesota, mimeo. Here we are focusing on the relationship between the network value and an aggregate user metric, aiming at keeping the network effect as general as possible. It would require further research into discerning the individual effects at play to arrive at a complete fundamental measure. For internet companies with strong network effects, the analogous daily active users (DAU) indicator is one of the most important performance and valuation metrics.